You can send individual messages to auditors for each list of raters they have to complete or you can send summary messages for all lists they need to complete. The summary option is used often when all reviews are on the same review cycle or the project autopilot is ON. 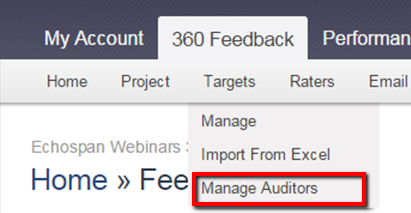 From the drop-down menu, select Targets >> Manage Auditors. Then, select the checkbox next to the Managers that need to receive reminders and click Create Messages. Depending on your email settings, you may need to go into your Email >> Queued Messages to review prior to sending. Then, select Summary Messages and choose the message that you want to send. Select the checkbox next to the Managers that need to receive reminders and click Create Messages. Depending on your email settings, you may need to go into Email >> Queued Messages to review prior to sending. Enter the date you would like the Auditor summary reminders sent in the space for Email Summary Reminder for Rater List Auditors. Make sure the autopilot is turned on and click Save Settings at the bottom of the page.